NETWORK FINALS: NCIS: NEW ORLEANS gained 0.1 in final numbers. CABLE HIGHLIGHTS: History’s CURSE OF OAK ISLAND topped Tuesday cable, down 0.02 to 0.74, with the pre-show half-hour down 0.09 to 0.27, and lead-out BROTHERS IN ARMS down a tick to 0.26. On Bravo, BELOW DECK gained 0.03 to 0.69, and UNANCHORED was at 0.16. 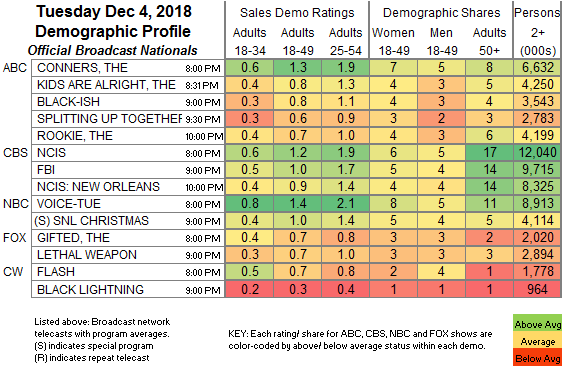 On USA, WWE SMACKDOWN fell 0.15 to 0.66, with lead-out episodes of CHRISLEY KNOWS BEST at 0.37/0.30, and REAL COUNTRY in the 11PM slot down 0.07 to 0.14. MTV’s THE CHALLENGE lost 0.05 to 0.40. On ID, BODY CAM ticked up to 0.34, and WELCOME TO MURDERTOWN was down 0.02 to 0.25. MSNBC’s RACHEL MADDOW SHOW led cable news at 0.34/0.51/3.5M, with CNN’s CUOMO PRIME TIME at 0.27/0.39/1.5M, and Fox News’s HANNITY at 0.27/0.41/2.6M. On TLC, THE LITTLE COUPLE rose 0.04 to 0.30, and 7 LITTLE JOHNSTONS was down 0.02 to 0.21. TBS’s THE GUEST BOOK dropped 0.06 to 0.28. Food Network’s CHOPPED fell 0.08 to 0.28. A&E’s LEAH REMINI: SCIENTOLOGY & THE AFTERMATH was down 0.07 to 0.27. 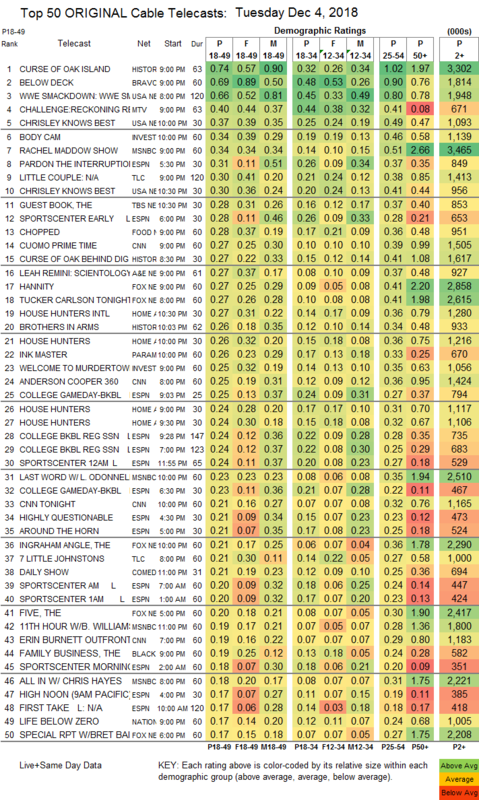 On HGTV, HOUSE HUNTERS INTL edged up 0.02 to 0.27, and HOUSE HUNTERS was at 0.26/0.24/0.24 compared to last week’s 0.27/0.26/0.25. Paramount’s INK MASTER ticked down to 0.26. Tru’s ADAM RUINS EVERYTHING shed 0.08 to 0.15. Discovery’s VEGAS RAT RODS lost 0.04 to 0.15. On Lifetime, HAPPILY EVER AFTER was steady at 0.14, and HONEYMOON ISLAND held at 0.09. Syfy’s NIGHTFLYERS fell 0.05 from Monday’s episode to 0.09.